Sticking to your financial goals is hard — really hard. It’s so hard, in fact, that 27% of adults in the U.S. stick to their New Year’s dieting resolutions longer than they stick to their financial resolutions. Everyone knows they should be saving more money, and everyone also knows the basic rules of thumb when it comes to saving more — skip the morning coffee run, create a budget, put all your spare change in a jar every day, etc. While these strategies can work, sometimes they’re not enough. If you’re a coffee addict, it likely won’t be long before you give in and go back to the coffee shop. If you’re busy, it’s easy to forget to update your budget every time you buy something. And it takes a long time to see results one penny at a time, making it all the more tempting to throw in the towel. But that doesn’t mean there aren’t ways to (easily!) save more money. These strategies take minimal effort, but it won’t take long before you start to see results. It should come as no surprise that people tend to spend more when they use credit cards for everyday purchases rather than cash, but most people don’t realize just how much more they’re spending. On average, people tend to spend around 12% to 18% more when using a credit card compared to cash, and while that may not seem like much, it adds up quickly. If, for example, you normally spend $500 in cash per month for dining, groceries, and other everyday purchases, that number could balloon to $590 if you use a credit card. Over a year, that $90 per month turns into over $1,000. Most people, though, can’t simply give up using a credit card — and you don’t have to. Just do it for one or two days per week. The key is to set a limit for yourself and push yourself to stay within those boundaries. For example, tell yourself you’re not allowed to spend more than $25 on your “cash only” days, and make sure you only have that much in your wallet (to avoid the temptation to cheat). 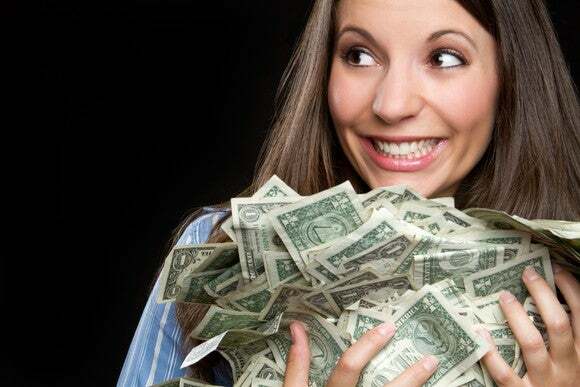 Nothing will be off limits — so you can still use cash to buy your morning coffee or go out to dinner if you want — but having a limited amount of money will force you to consider what you really need versus what you want. Then, hopefully, that way of thinking will stick with you even when you go back to using your credit card. Yes, we all know how cutting out coffee every morning can save money, but the thought of never buying coffee again is enough to make any coffee lover ditch that financial goal . Instead, put a deadline on your goal. Goals are more manageable when they’re broken up into bite-size chunks, so instead of telling yourself you should skip the coffee every morning for as long as possible, make it just a month (or even a week, if you’d rather start small). Once you make it through the month, you can go back to buying coffee, but you have to cut out a different guilty pleasure for the next month — like shopping online, going to the movies, or buying a candy bar and a bag of chips at the convenience store every time you stop for gas. Even though you’re not giving up anything completely, you’re still saving money by giving up one thing at a time. So, for example, if you spend an average of $20 per week by hitting the drive-thru on your way home from work, by eliminating that for one month, you’ll save $80. If you save that much each month, that amounts to over $900 per year. If you’re feeling extra motivated, try eliminating two or even three things — no matter how small — each month to save even more money. As the workforce becomes more competitive, many companies are standing out by offering more benefits to employees . And while most people are aware of the basic benefits the majority of employers offer — like health benefits and a 401(k) plan — your company may offer more than you realize. For example, maybe your employer offers commuter assistance or phone bill reimbursement if you use your personal phone for business. Or perhaps your company will help cover your internet bill if you work from home. Sometimes employers won’t advertise these benefits even if they are available, so you’ll need to dig through your employee handbook to see if you’re missing out on any perks. Even if the benefits seem minor, they can add up over time. If your company offers a $25 per month wellness stipend and $20 per month to help cover commuting costs, that’s $540 per year. Now, say you’re doing all the things on this list and saving a few dollars here and there. Say you’re saving $90 per month by using cash a couple days per week instead of a credit card, saving $80 per month by cutting out a different guilty pleasure each month, and saving $45 per month by taking advantage of workplace benefits. That’s a grand total of $215 per month, or $2,580 per year! So while saving money isn’t easy, it is doable — even for those of us who would rather hit the gym every day to keep a New Year’s resolution rather than stick to a daily budget. 4 Ways to Take Your Pension Money: Which Should You Choose?